The Center for Copyright Information, a partnership between the RIAA, MPAA and several major Internet providers, has had its company status revoked. The CCI, who are leading the "six strikes" anti-piracy scheme in the US, has violated state laws and is unable to conduct any official business anywhere in the United States. In addition the outfit faces civil penalties and risks losing its name to a third-party company. During the summer of 2011 the MPAA and RIAA teamed up with five major Internet providers in the United States, announcing their “six strikes” anti-piracy plan. 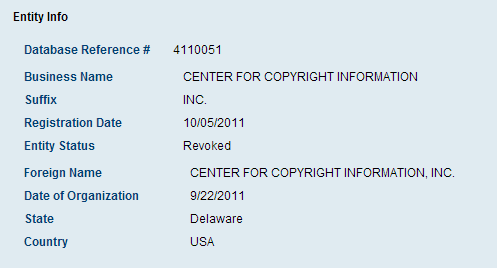 The parties founded the Center for Copyright Information (CCI) and few months later they started a non-profit company with the same name in Delaware. After more than a year of delays the CCI finally launched its Copyright Alert System during February. But just when it appeared the group was on the right track, it met another roadblock. According to the Columbia Department of Consumer and Regulatory Affairs (DCRA), the company leading the six-strikes program has had its status revoked. This pretty much means that the company is unable to conduct any official business anywhere in the United States. The revocation means that CCI’s articles of organization are void, most likely because the company forgot to file the proper paperwork or pay its fees. “If entity’s status is revoked then articles of incorporation / organization shall be void and all powers conferred upon such entity are declared inoperative, and, in the case of a foreign entity, the certificate of foreign registration shall be revoked and all powers conferred hereunder shall be inoperative,” the DCRA explains. Unfortunately for the CCI, the DCRA doesn’t have a strike based system and the company is now facing civil penalties and fines. It appears that company status was revoked last year which means that other businesses now have the option to take over the name. That would be quite an embarrassment, to say the least, and also presents an opportunity to scammers. “When a Washington DC corporation is revoked by the DCRA, its name is reserved and protected until December 31st of the year the corporation is revoked. After December 31st, other business entities may use the corporations name,” the DCRA explains on its website. Technically the CCI could have started a new corporation under a different name but this seems unlikely. TorrentFreak was able to confirm that at least one of the participants in the Copyright Alert System paid a substantial amount of money to the revoked company last year. As with any other company, CCI will be able to have its company status reinstated after fulfilling its obligations. A source connected to the Center of Copyright Information informs TorrentFreak that the proper paperwork has been filed now. This most likely means that the DCRA will update the company’s status in the near future. Finally, it will be interesting to see if this situation holds consequences for the anti-piracy warnings that are supposedly being sent out at the moment – the Internet seems strangely devoid of U.S. subscribers in receipt of any. Update: The CCI filed the proper paperwork and is back in action. Is The “Six Strikes” Anti-Piracy Scheme Doomed? c There are 138 comments. Add yours?